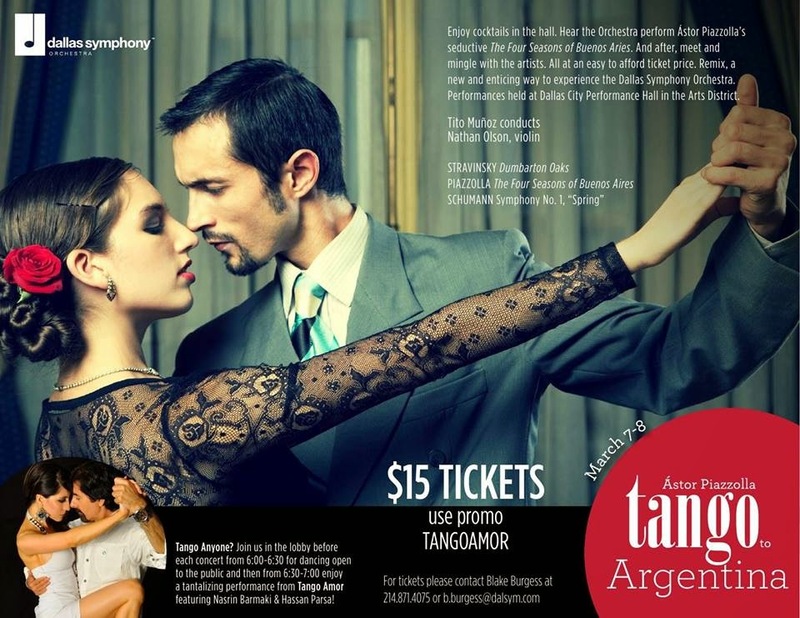 This weekend, March 7th and 8th: Andrey and I have been invited to dance with TangoAmor before the Dallas Symphony Orchestra's presentation of "ReMix: Astor Piazzolla - Tango to Argentina." Join us from 6:00-7:00 in the lobby before the concert to see some open tango dancing along with performances from TangoAmor. Dallas, TX (February 21, 2014) - The Dallas Symphony Orchestra (DSO) announces ReMix: Ástor Piazzolla - Tango to Argentina, featuring the tango-infused The Four Seasons of Buenos Aires. DSO Co-Concertmaster Nathan Olson will perform the solo violin part in this red-hot take on Vivaldi's The Four Seasons. The program also includes Stravinsky's Dumbarton Oaks Concerto and Schumann's Symphony No. 1, Spring. The concert at 7 p.m. March 7-8, 2014 at Dallas City Performance Hall will feature free tango dancing and tango demonstrations in the lobby one hour before the performance. The dancing will be led by Dallas-area group Tango Amor. ReMix is the Dallas Symphony's own new-style concert series featuring a chic, casual concert experience, an earlier start time, drinks you can bring into the concert hall and a chance to meet and mingle with musicians after the performance. Three ReMix concerts are scheduled in the Dallas Symphony's 2014/15 season.